Inua Ellams, writer of world-wide hit Barber Shop Chronicles, returns with his new play Half God of Rainfall, a contemporary saga that weaves poetry with storytelling in a majestic, chaotic journey across mythologies that transports us from a tiny village in Southern #Nigeria to the further reaches of our galaxy and beyond. Modupe (Rakie Ayola), cursed with extraordinary beauty, draws the unwanted attention of the Greek and Yoruba gods. 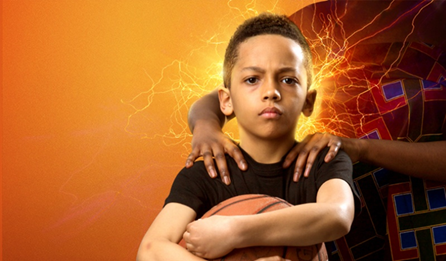 Her son Demi (Kwami Odoom), half Nigerian-mortal, half Olympian child, is bestowed with powers; one of them manifests in the game of basketball. When he unknowingly sparks Zeus’ wrath, Modupe tries to protect him from the capricious whims of the gods. Directed by Nancy Medina, this world-premiere a collaboration between Kiln Theatre, Fuel and Birmingham Repertory Theatre. Supported by London Community Foundation & Cockayne – Grants for the Arts.